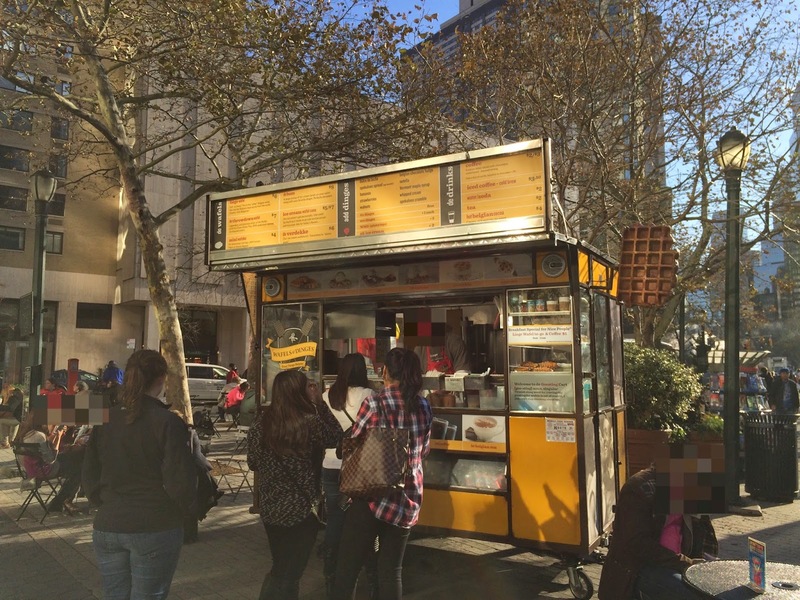 There's a waffle cart on 66th and Broadway always called "Wafels & Dinges," and I finally tried one waffle today. 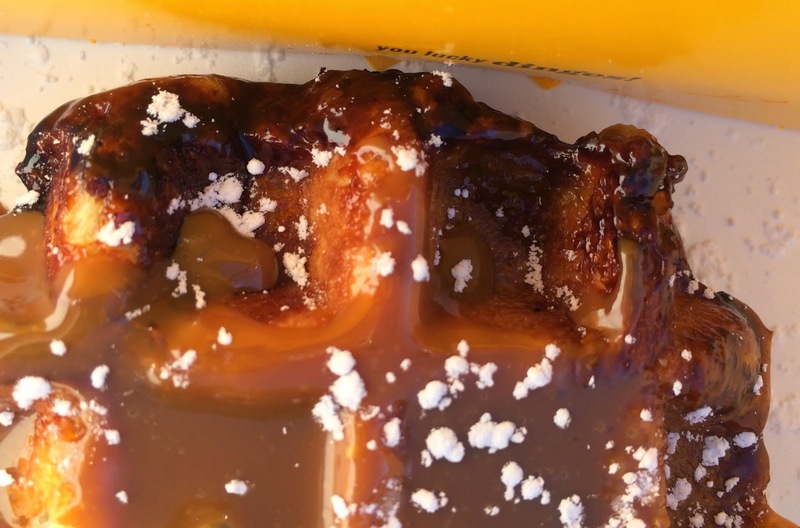 They write waffle in Dutch and the menu was all spelled as "wafel," which Netherlanders immigrated into the states used for pancakes with honeycomb patterns. And the spelling was Americanized and in English, it spells as "waffle." Though there're a couple of people ahead of me, I didn't wait long. 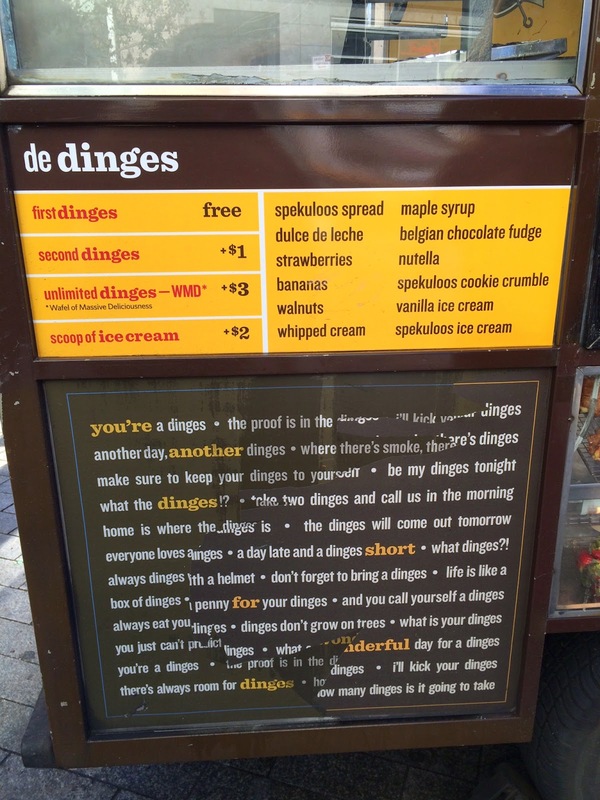 There're some waffles ready in the showcase, and underneath, there's a description of a slang. 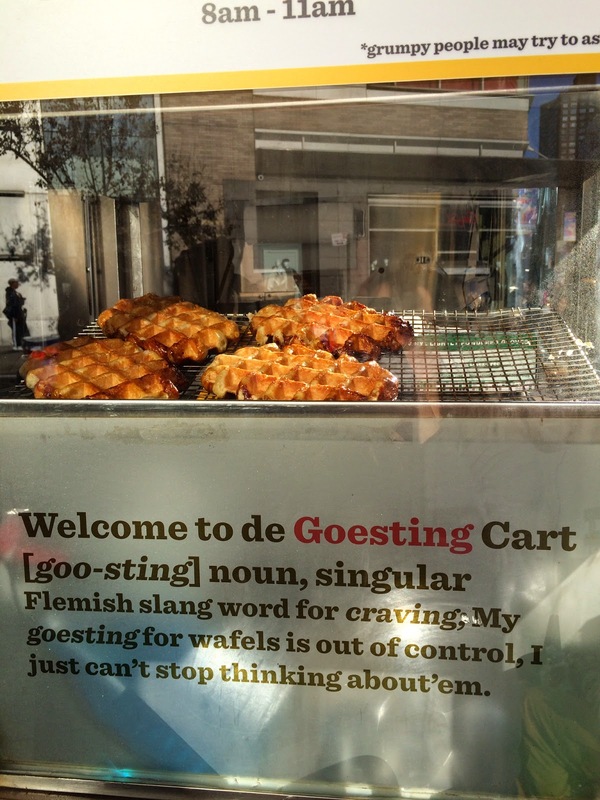 "Goesting" pronounced as [goo-sting] is a singular noun and a Flemish slang word for "craving." 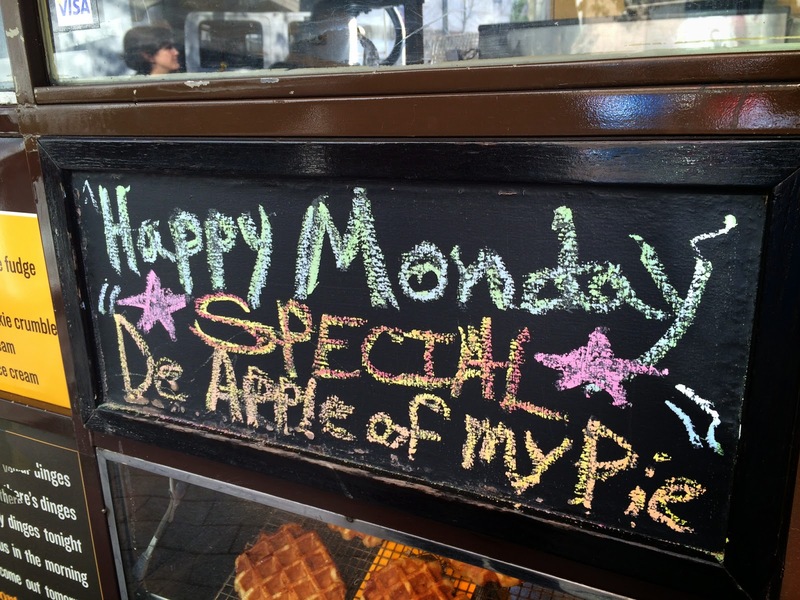 Today's special menu was apple pie, but I only got a waffle. 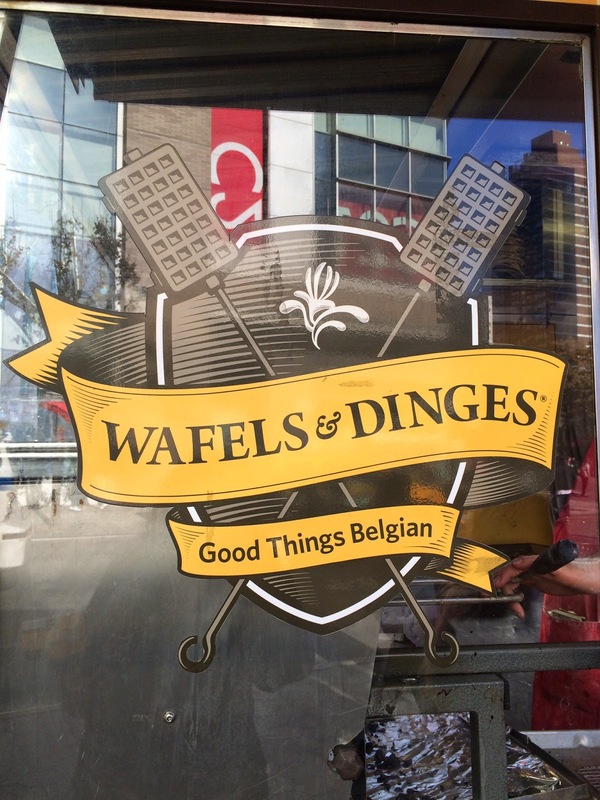 When I ordered a Liège Wafel, the employee said I could choose one free topping and I chose "dulce de leche." 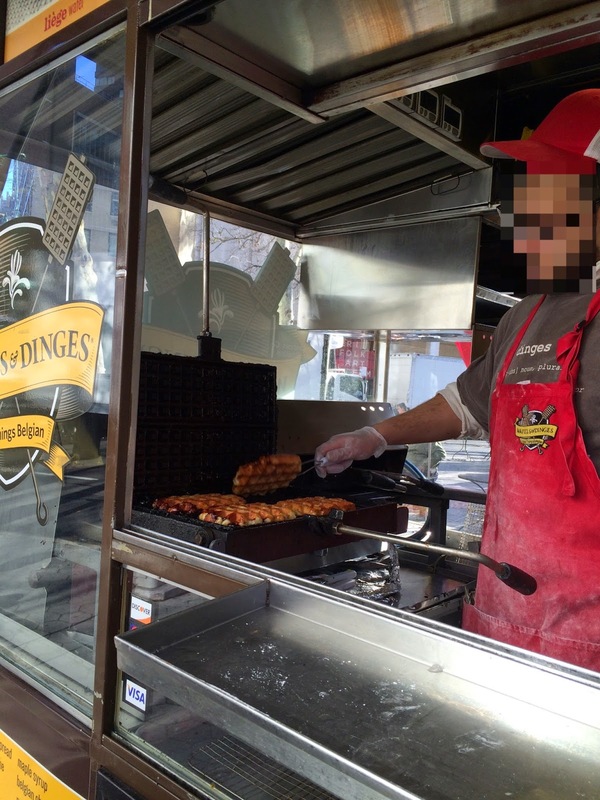 I thought he'd grab one of the waffle in the showcase, but he actually took out from a grill. 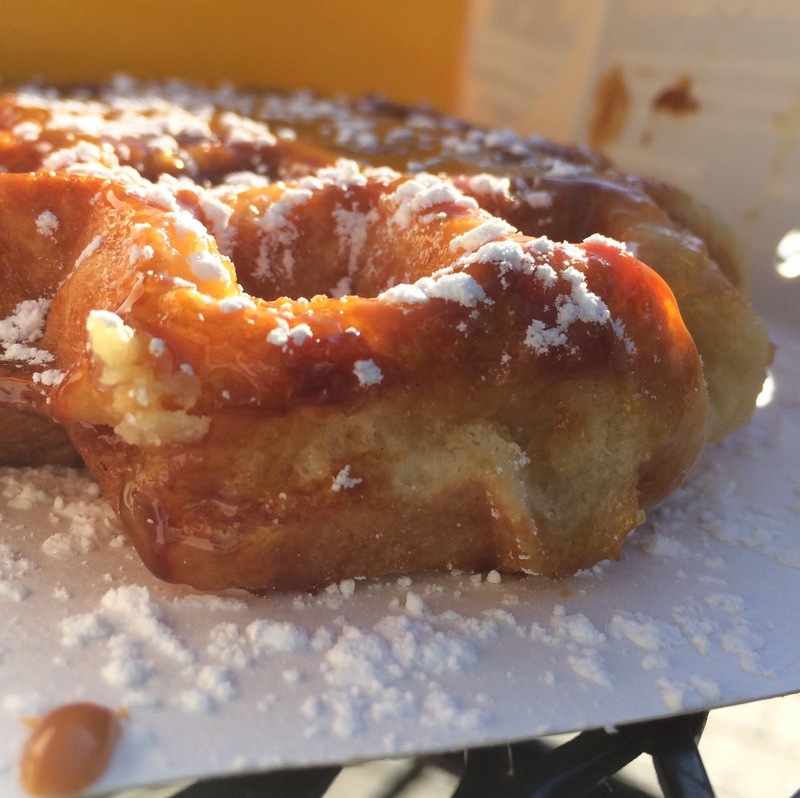 With lots of white sugar, there's a generous amount of brown dulce de leche. It's about same size as my hand; 20cm (7.8 inch). Not only the size was large, but it's also tall and about 3cm (1.2 inch) height. Plastic cutlery was self-service, by the way. 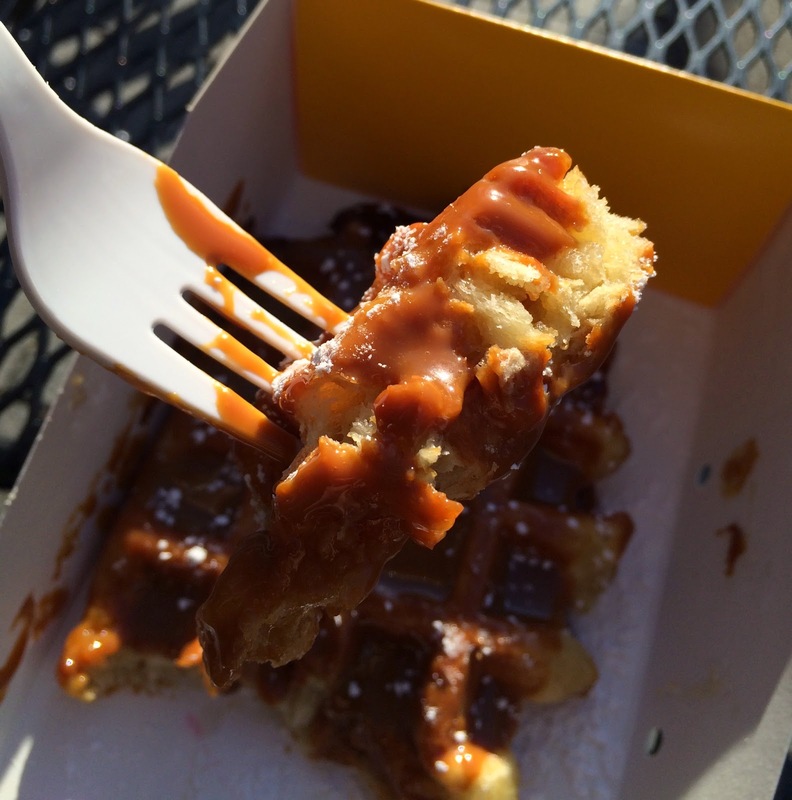 The waffle had crispy surface and inside was very moist and warm. The texture was soft but also a little bit chewy. Dulce de leche first tasted like thick and sticky caramel sauce, and in the end, it had intense sweetness that condensed milk has. 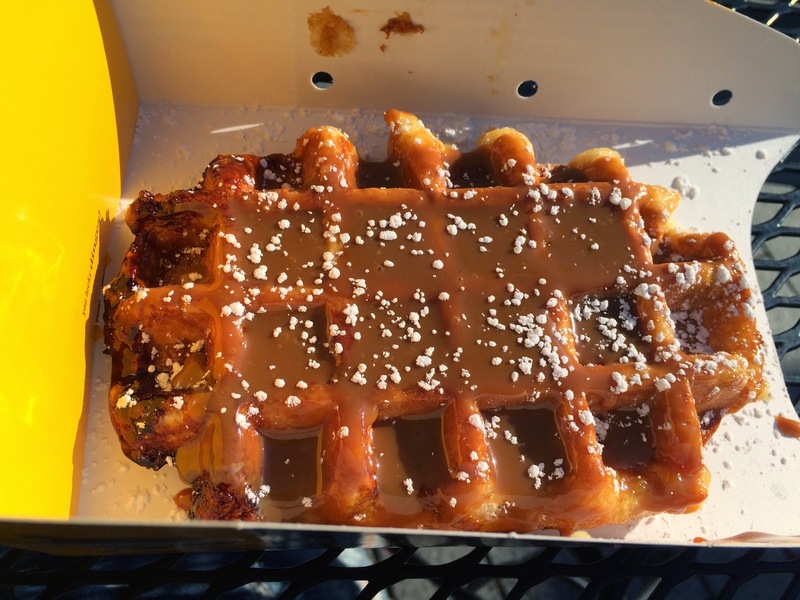 Some parts of waffle had caramelized sugar from the griddle. It had slightly bitter flavor and was crunchy. 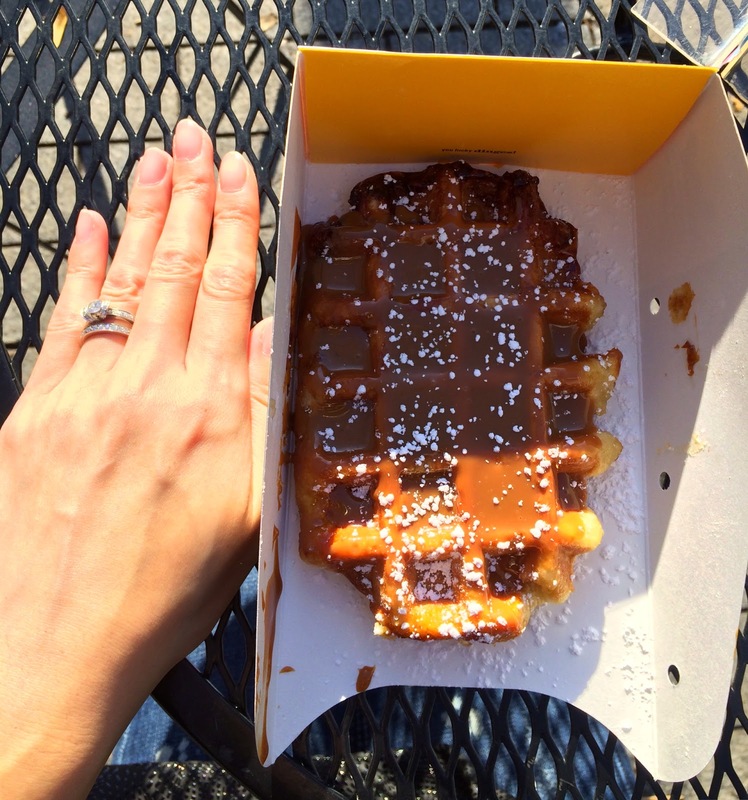 The waffle was large, tasty, and warm and I really enjoyed it. They have some savory menus, so I think I'm gonna try something salty next time. 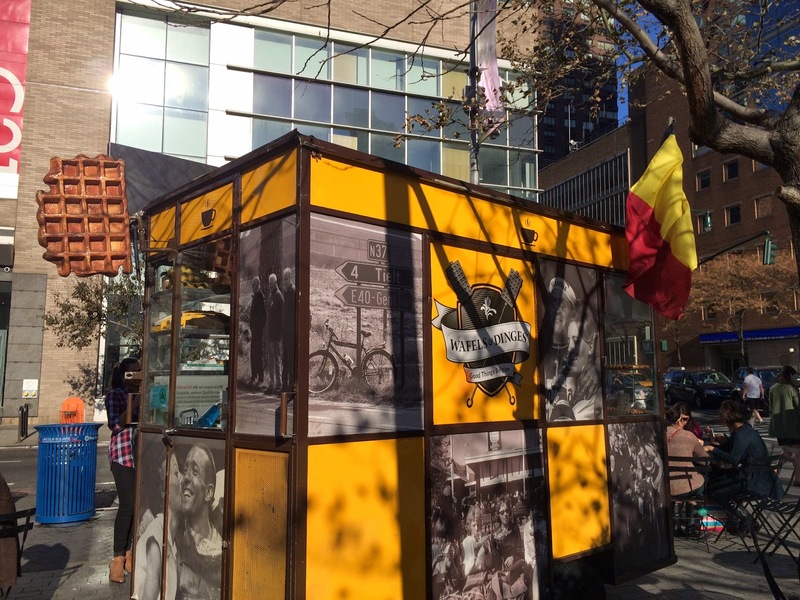 Other food trucks I've reviewed.